May the Force of Lean be with You! 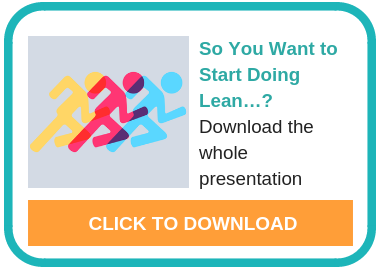 This Guide will not only help you to understand what lean is, but it will also give you information on various topics surrounding Lean with many case studies, expert articles, videos and more. We offer the newest content by experts from your industry! Whilst Lean sometimes is only seen as a set of tools for continuous improvement, a Lean mindset should be encouraged throughout the whole company. Promoting Lean at all levels will lead to a much better result. For more definitions click here. To read his whole article click here. 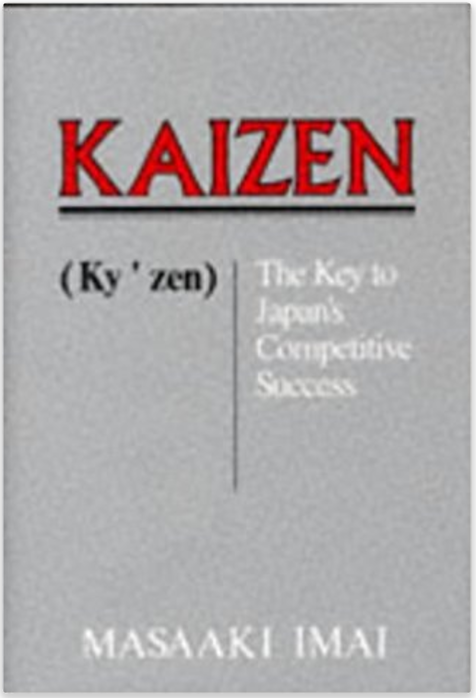 Kaizen is Japanese and stands for "Continuous Improvement". It refers to activities aiming for the implementation of positive, ongoing changes at the work station. In other words, it is a strategy that involves all employees from every company level to work together and proactively, with the goal of achieving regular, incremental improvements to the manufacturing process. 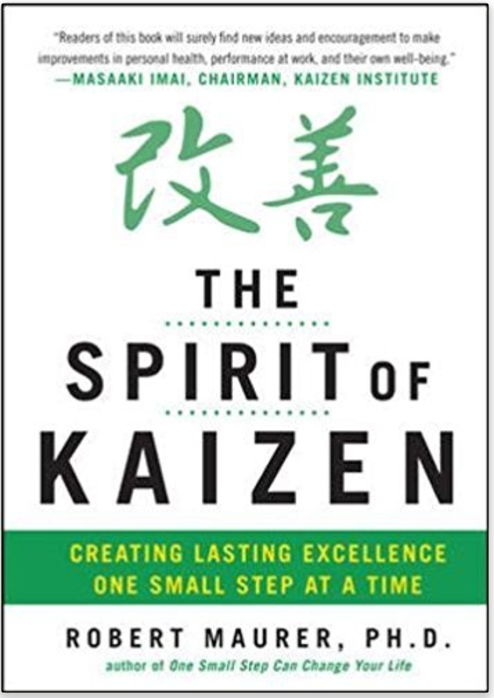 Kaizen puts emphasis on the significance of continuous improvement. It is not enough to undertake changes once. Organizations have to make an effort in continuing improvements repeatedly. Numerous companies have applied Kaizen's concept and strategy in order to increase employee productivity, reduce costs, and improve the overall customer experience. If you want to learn more about Kaizen and Gemba click here. 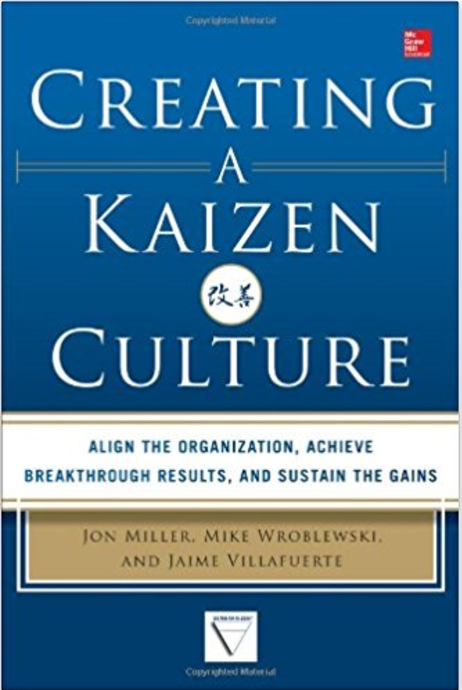 View the full List of the 10 Best Kaizen Books here. Lean is not a new methodology but in the last years it gained more and more importance to businesses in order to achieve Operational Excellence. It originated in manufacturing in Japan with the Toyota Production System (TPS) which combined many best practices of other companies with the goal to increase competitivity. TPS influenced many following methodologies like Six Sigma. According to the Lean Enterprise Institute the development of TPS is credited to Taiichi Ohno, Toyota’s chief of production in the post-WW II period. Beginning in machining operations and spreading from there, Ohno led the development of TPS at Toyota throughout the 1950s and 1960s, and the dissemination to the supply base through the 1960s and 1970s. Outside Japan, dissemination began in earnest with the creation of the Toyota- General Motors joint venture—NUMMI—in California in 1984. The concepts of just-in-time (JIT) and jidoka both have their roots in the prewar period. Sakichi Toyoda, founder of the Toyota group of companies, invented the concept of jidoka in the early 20th Century by incorporating a device on his automatic looms that would stop the loom from operating whenever a thread broke. This enabled great improvements in quality and freed people to do more valuecreating work than simply monitoring machines for quality. Eventually, this simple concept found its way into every machine, every production line, and every Toyota operation. Read more. So is Lean only used in manufacturing? In the contrary! Lean is great for every kind of business to increase consumer-satisfaction, team-work and profit. Map the value Stream: Identify all the steps in the value stream for each product family, eliminating whenever possible those steps that do not create value. Create flow: Make the value-creating steps occur in tight sequence so the product will flow smoothly toward the customer. Establish pull: As flow is introduced, let customers pull value from the next upstream activity. Seek perfection: As value is specified, value streams are identified, wasted steps are removed, and flow and pull are introduced, begin the process again and continue it until a state of perfection is reached in which perfect value is created with no waste. The five-step thought process for guiding the implementation of lean techniques. Image copyright 2016, Lean Enterprise Institute, Inc. All rights reserved. 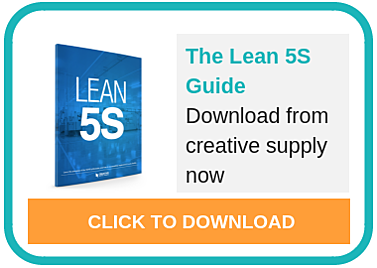 What happens if we combine Lean and Six Sigma? Define: define the problem in order to solve it. Measure: measure all of your available data as well as take a more detailed look into your processes. Analysis: perform analysis of your findings and figure out the problem's root. Improvement: once you analyzed your data, find possible solutions and implement them. and Control: ensure to maintain your new implemented process. Lean and Six Sigma are two different approaches to reach the same goal. Besides reducing waste they aim to minimize costs and maximize efficiency. Although they are different they work best hand in hand. Click here to download the new Free 5S Guide to 'learn the principles of 5S/6S philosophy and how to successfully implement it in any facility'. Maybe we should just abandon continuous improvement? In his article, in the Harvard Business Review, Ron Ashkenas states: "Absolutely not! It has created a tremendous value and still drives competitive advantage in many companies and industries. But perhaps it's time to nuance our approach." We should think about how and where it makes sense to implement it in the organization, so that it doesn't discourage creativity. We should also consider eliminating and disrupting processes instead of improving them. And finally, as the Lean methodology has to become part of the culture we should always look at how a change will impact the dynamics in the company. you don't get continuous improvement without mutual respect. This is the common "TPS Temple" or "House of Lean" that gets depicted. It's an expression of the technical way Toyota approaches production. A Foundation of Stability, made possible through Heijunka (Leveling), Standardized Work, and Kaizen. Two equal pillars of "Just in Time" and "Jidoka"(Built in Quality). Just this technical aspect shows how lean would NEVER "make defects faster". You can only increase process velocity at the rate for which quality and stability will allow - each serves the other. Leaders are Teachers (Teach others how to do 1 -3)". Click here to read the whole article by Nick Ruhmann. Test your knowledge on Lean and answer this Question: We are a small company with approximately 150 employees, 3 manufacturing locations and 5 nonwoven processing lines. The nonwoven process is a continuous-flow process as opposed to assembly. The decision has been made to embark on a lean/continuous-improvement initiative for our company. There is no one in our company who specifically has lean experience. Do you have any advice on the best way to begin this journey? The company is open to using outside consultants. Compare your approach to Larry Fast's explanation in his article on 'What is the best way to begin a Lean or Continuous Improvement Journey'. 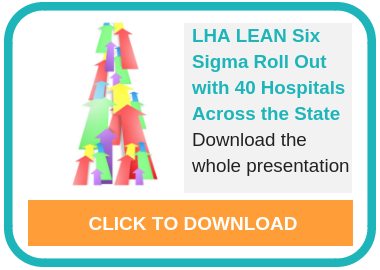 This presentation on '10 Top Tips for Implementing Lean Successfully' offers the 10 most important things any organization new to lean needs to put in place as soon as they get back to their office to set themselves up successfully on their lean journey. Watch this video to learn about 'Integrating Lean and Agile to Transform New Product Development'. Take inventory of the key processes you are responsible for and determine who the key users, i.e., your customers, are. Interview key customers on each process to find out which ones they regularly use, what works well and what doesn't. Do you have the information necessary to define the problem and begin to problem solve? Form a team of your staff experts, including a knowledgeable user, and begin. Importantly, in addition to speaking directly with your customers, don't forget to create a forum right up front for open discussion and input from your staff members.To learn more about the 5 steps click here. As mentioned before Lean shouldn't only be seen as a methodology or a set off tools to achieve continuous improvement and reduce waste, it is also very important to integrate it into the company's culture. What does this mean? Changes always affect the whole company. It is not possible to only change processes and expect no other consequences, positive and negative. Lean has to be promoted and implemented throughout the whole company. It has to become a mindset and part of the company culture. This also means that Managers have to change their way of thinking and adapt Lean Leadership. Lean Leadership means moving away from traditional concepts of management, where the manager gives instructions, only focuses on short-term results and the team members are expected to do their tasks. In Lean Leadership the manager has a strategic focus, he is at the workplace, asks questions and mentors his team members who do standard work, improve processes, measure results and get the training they need. 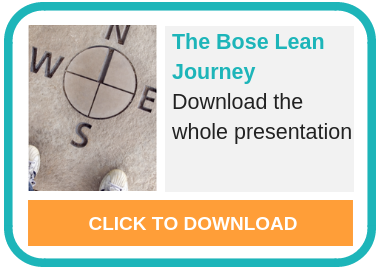 If you want to learn more about leading culture change through Lean Leadership click here. "Lean also means creating a culture of structured problem solving.To do so, we have to understand how systems drive behaviors. Enterprise level culture is really the behaviors of people at the unit or local level. Essentially, the principle follows; In order to engineer the culture we want in our organization, we have to find a way to change specific behaviors. We can drive those desired behaviors by creating a system made of literal items such as an A3 sheet of paper that requires a written problem statement and root causes, which would drive a Kaizen event where teams can graphically denote the issues they are faced with. It comes down to the systems. Creating systems that drive a behavior around structured problem solving will create a culture of structured problem solving. Once you create this specific culture you have the system to design a different culture or modify the existing culture through the use of systems to drive behaviors." think of people as "heads" or "variable resources"
Real lean knows that you cannot truly have continuous improvement, everywhere, all the time IF you don't respect people as people. Real lean knows that the best way to build / show respect for people is to trust them, listen to them, guide them, thereby - building better people. In this way, people are not a variable cost you want to flex up and down - but a fixed cost, or even a capital investment that continues to appreciate. Like a chunk of gold, that will increase in mass if you only appreciate it - or shrink if you ignore it." Learn more about 'FINDING A "REAL" LEAN CULTURE JUST BY CARING' by Nick Ruhmann. For more case studies click here. "The book that coined the term “Lean” based on the outcomes of more than 5 years of study of the Japanese automobile industry by MIT. 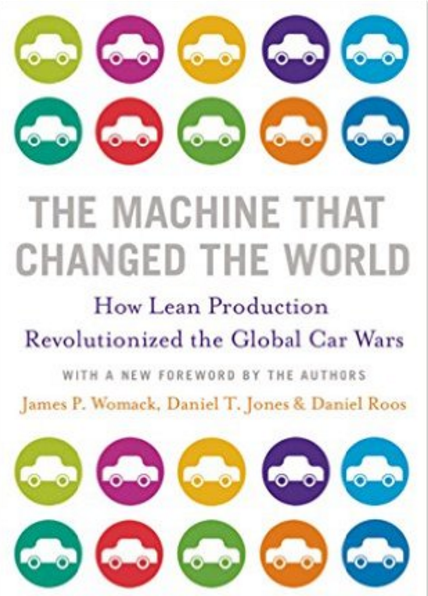 Womack, Jones and Roos thoroughly document the whole of the Toyota Production System, pinpoint the advantages of Lean manufacturing over the prevailing mass-production system used in the western world at the time, and correctly predicted the rise of Lean manufacturing principles, not just in automobile manufacturing, but in any value-creating endeavor." 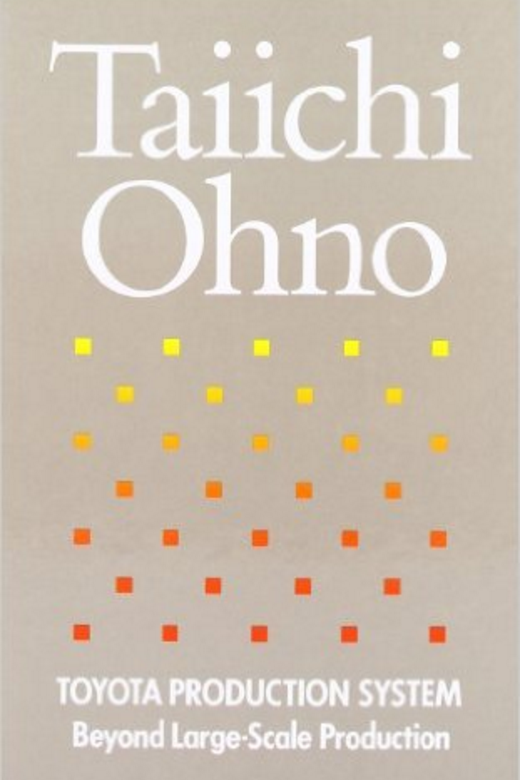 "Combining his candid insights with a rigorous analysis of Toyota's attempts at Lean production, Ohno's book explains how Lean principles can improve any production endeavor. 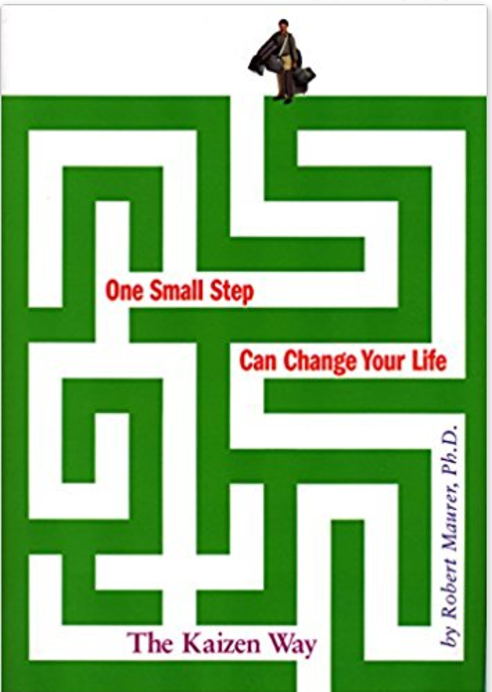 A historical and philosophical description of just-in-time and Lean manufacturing, this work is a must read for all students of human progress. On a more practical level, it continues to provide inspiration and instruction for those seeking to improve efficiency through the elimination of waste." 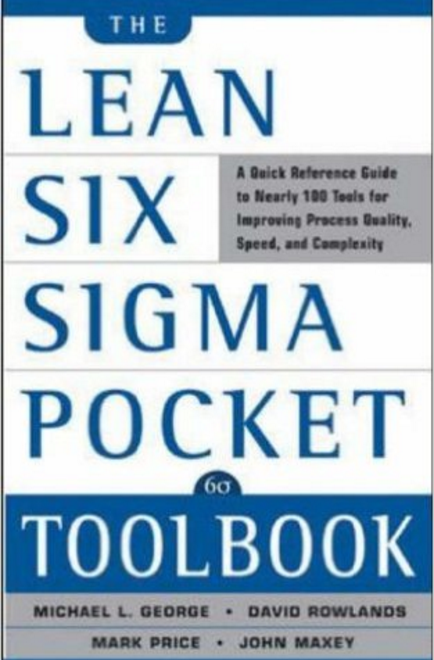 "The Lean Six Sigma Pocket Toolbook is today's most complete and results based reference to the tools and concepts needed to understand, implement, and leverage Lean Six Sigma." 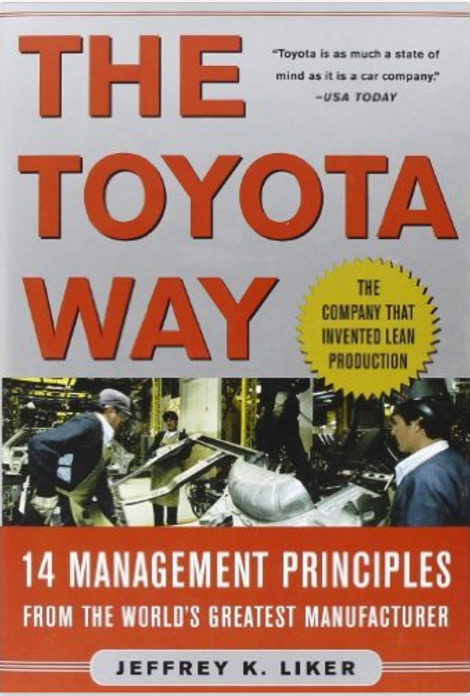 "In The Toyota Way, Dr. Liker shifted the focus away from superficial tools and techniques of the production system and onto the 14 key principles that define the Toyota style of management. 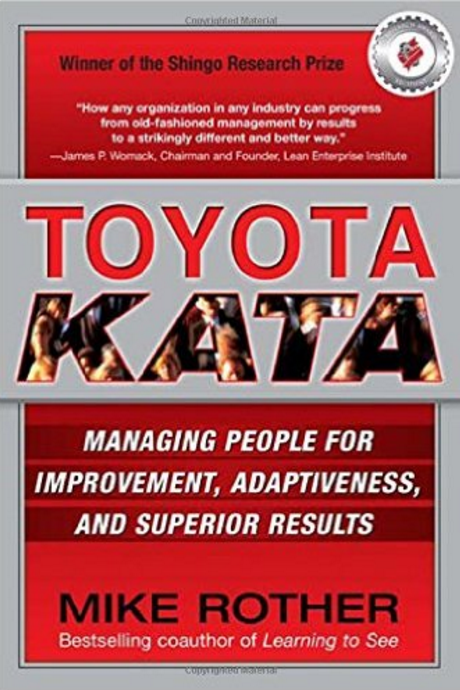 In doing so, the book was the first to articulate the true source of Toyota’s success in a format available and understandable to the masses." "Of all the texts on Lean and continuous improvement, Toyota Kata achieves what no other book before it has fully accomplished: translating Lean into a set of simple, practical routines, organized around improvement and coaching, that can be readily and effectively practiced at all levels of an organization." Click here to see the full List of Top 10 Lean Six Sigma Books. AllAboutLean.com blogs on the different aspects of lean manufacturing and lean administration. The blog has a strong focus is on practicability, although some posts will also delve into theoretical details. Lean Blog covers a number of themes about lean that are universal, regardless of industry. 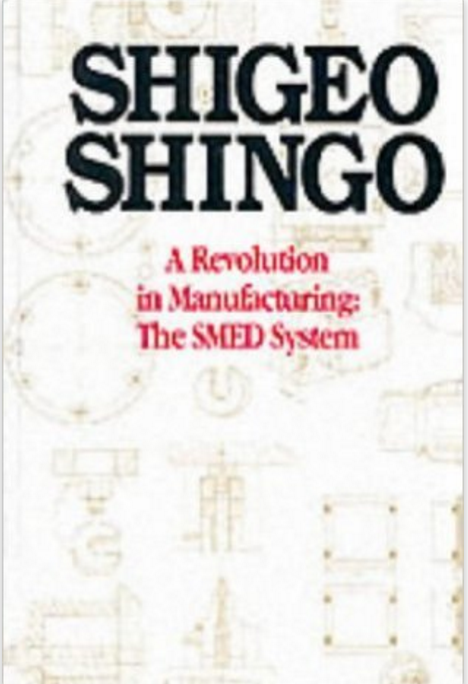 This blog led to Shingo Award-winning books including Lean Hospitals: Improving Quality, Patient Safety, and Employee Engagement . 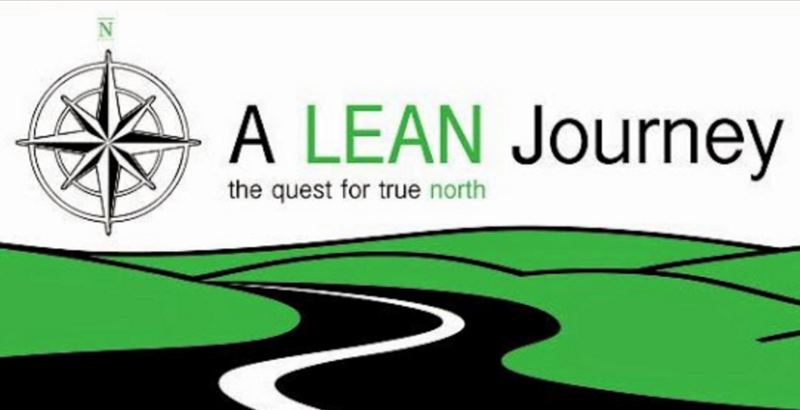 This site is dedicated to sharing lessons and experiences along the Lean Journey in the Quest for True North. The blog also serves as the source for learning and reflection which are critical elements in Lean Thinking. Bill Waddell is a Global Supply chain expert and one of the original Lean Accounting "Thought Leaders". He has over 30 years experience in Manufacturing and Accounting, and is widely regarded as being at the forefront of Lean Manufacturing. See the full List of Top 10 OpEx blogs. Hear from the best in your Industry! 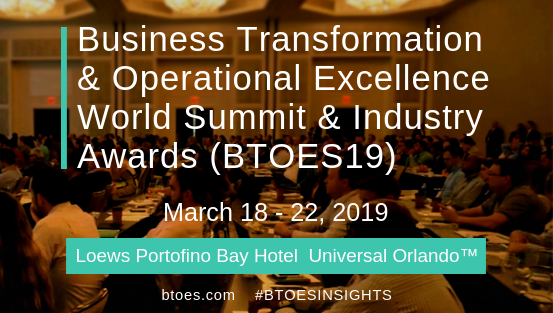 Get all 10 exceptional Video Presentations from the Business Transformation & Operational Excellence World Summit. Hear from the experts of your industry how they discuss various topics concerning operational excellence. Sometimes books and blogs don't help and you just need to learn it from professionals. You can take lessons and learn about Lean Six Sigma from experts and get certified at the end of the courses. But not every provider uses the same levels! But what are the benefits of getting the certified? It can have a great impact on your future career for many reasons. Being certified can be useful in many different industries and will look great on your CV. It will not only show that you are committed to keep learning but it will also show your analytical skills. It will also improve the business you work in!